Two bright-green comets are swinging around the sun in September and December of 2018, providing spectacular views for skywatchers — both with and without telescopes. HERE: Comet 21P/Giacobini-Zinner passes by Capella, the "Goat Star," in this deep-space image by astrophotographer John Chumack. The comet will make its closest approach to the sun on Sept. 10 (the same day it will be closest to Earth), and it is visible with binoculars and small telescopes. Chumack captured this photo of the comet in the early morning of Sept. 3, 2018 using a 300-millimeter (11.8 inches) telephoto lens. Astrophotographer Alexander Vasenin captured this photo of Comet 21P/Giacobini-Zinner from Moscow Oblast, Russia, on Aug. 18, 2018, at 12:32 a.m. local time (5:32 p.m. EDT, 2132 GMT on Aug. 17). Astrophotographer John Chumack captured this view of Comet 21P/Giacobini-Zinner from his backyard observatory in Dayton, Ohio on Sept. 2, 2018. 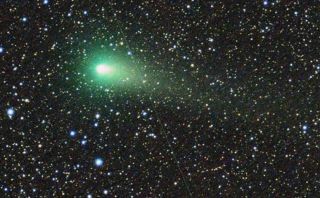 "Despite the strong moonlight, this image of the comet is shown with overlapping ion and dust tails," Chumack told Space.com. He estimated the tail to measure about 1.25 degrees in length, "but it could be longer, as strong moonlight hindered the observation of any fainter portion of the tail," he added. Comet 21P/Giacobini-Zinner glows bright green in this photo captured from the Northolt Branch Observatories in London on Aug. 17, 2018, between 1:23 a.m. and 1:50 a.m. local time (8:23 p.m. and 8:50 p.m. EDT, 0023 and 0050 GMT). Astrophotographer Alex Guadalupe captured this view of Comet 21P/Giacobini-Zinner from Caguas, Puerto Rico, on Aug. 21, 2018, at 11:15 p.m. local time (0315 GMT on Aug. 22). This sky map shows the approximate location of Comet 21P/Giacobini-Zinner during its closest approach to Earth on Sept. 10, 2018 at 2:27 a.m. EDT (0627 GMT), as seen from New York City. Get Ready for Comet #2! Comet 46P/Wirtanen appears as a speck in this telescope image captured by Mike Olason in Denver on Aug. 11, 2018, at 1:13 a.m. local time (3:13 a.m. EDT, 0913 GMT). Comet 46P/Wirtanen, which will become visible to the naked eye as it makes its closest approach to Earth in December, appears as a faint smudge in this image captured by amateur astronomer Gideon van Buitenen in Auberry, California, on Aug. 13, 2018, at 4:05 a.m. local time (7:05 a.m. EDT, 1105 GMT).